TI LA SHU LITTLE QUEEN CLEOPATRA - World Pedigree DataBase Tibetan Terrier , Tibetan Terrier Pedigree DataBase. Titles: ICH, MKSZ HSCH, SKCH, MKSZ HGRCH, HGRCH, HSCH, MKSZ HCH, RCHCL, RCH, MKSZ HJub.SCH, SRBCH, HCH, HJCH, MKSZ HJCH, MKSZ HDW '11, ÁTK Top Derby Female '11, TKOK Top III. Junior Female '11, ÁTK Junior Club Winner '12, ÁTK Top Female '12, TKOK Top Female '12 + FCI IX. Top 10., TKKE Top Female '13, TKOK Top Female '13 + FCI IX. Top II. TKOK Top Female '12 + FCI IX. TKOK Top Female '13 + FCI IX. 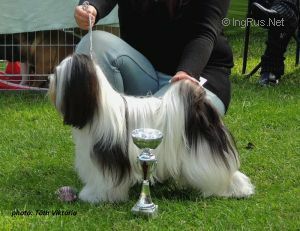 2010 Interchampion, Ch. CZ, JCh.